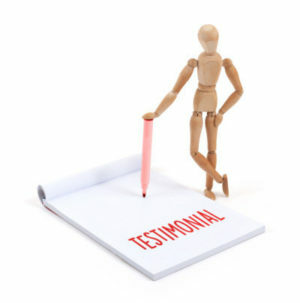 It’s an almost irresistible heading on a website: Testimonials. Click on the link, and you get to see nice things said about the business by people we assume are real, even though they are often just identified by a first name and last initial. These testimonials are short, heartwarming and sometimes witty — and we love to read them. How do you get someone to endorse your store? Asking your best customers is a good way to start. You might even give them a sample quote and ask if it is something they’d be comfortable with saying. Assure them that you will only be using their first name and last initial — or possibly even quoting anonymously, although of course saying something like “Best store in town” without being able to back it up with some attribution could backfire. Don’t be afraid that your request for a testimonial will be turned down, or garner a negative response. We all understand that people may be too busy or too shy to say something. And a critical statement, although it may hurt, is a chance to correct a situation that may otherwise lead to negative PR. You might conduct a contest, asking for testimonials and promising a small reward to those quotes you end up using. 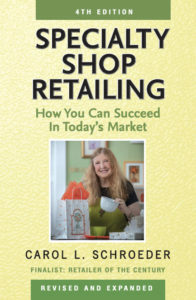 In fact, here’s an offer to you: be one of the first to get a free copy of the 4th edition of Specialty Shop Retailing, due to be published in December, if I use your quote about the last edition on the back cover. In this case your full name will be used, and I will feature your store name and location. Just send it to specialtyshopretailing@gmail.com!